Does Chlorine Hurt your Eyes? Home » What's New » Does Chlorine Hurt your Eyes? Just because the summer is coming to an end, doesn’t mean that we have to say goodbye to the swimming pool. Whether it means a nice refreshing dip on a warm fall afternoon or a winter swim in an indoor pool, swimming is a great activity for both fun and exercise. Nevertheless, have you ever wondered if all of this splashing around in chlorine-filled water can affect your eyes and vision? Swimming pool water is chlorinated to keep it sanitized. The chlorine helps reduce water-borne bacteria and viruses to prevent pathogens and disease from spreading. While chlorine is a successful water sanitizer, its efficacy depends on a number of factors including how recently it was added to the water, the concentration of the chemical and how much the pool is used. When your eyes are submerged in chlorinated pool water, the tear film that usually acts as a defensive shield for your cornea is washed away. This means that your eyes are no longer protected from dirt or bacteria that are not entirely eliminated by the treated pool water. So, swimmers can be prone to eye infections. One of the most common eye infections from swimming is conjunctivitis or pink eye, which can either be viral or bacterial. Another eye issue that often develops from contact with chlorinated water is red, irritated eyes. 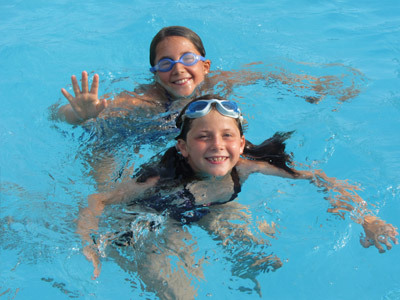 When your cornea dehydrates as a result of exposure to chlorine, the irritation is often accompanied by blurriness, which can result in distorted vision temporarily. Although these symptoms usually disappear within a few minutes, the recovery time tends to increase with age. Using lubricating eye drops can help alleviate symptoms by restoring the hydrating, protective tear shield in your eye. If you wear contact lenses, be sure to remove them before jumping in the pool. Contact lens patients are prone to an eye infection called acanthamoebic keratitis, which develops when a type of amoeba gets trapped in the space between the cornea and the contact lens and begins to live there. This infection can result in permanent visual impairment or lead to ulcers on the cornea. If you have taken a dip with contacts on, be sure to remove your lenses, rinse them with lens solution and refrain from sleeping in them after you've had a swim. There is no way to be one hundred percent sure of what is floating around in a swimming pool, so the best way to protect your eyes is to use water-tight goggles that fit you well. This way you can enjoy your swim without risking your eyes or your vision. Serving East Hartford, Vernon, South Windsor,CT and surrounding towns. Totalvision Eyecare Center Of Manchester, Pc has been awarded as a top Optometry practice with some of Manchester's best Optometrists. TotalVision Eyecare Center of Manchester Located at 362 Middle Turnpike W, Manchester, 06040, CT. Phone: 860-649-3311. http://www.totalvisioneyecare.com/.